Elizabeth Birnbaum became head of the Minerals Management Service in July 2009. 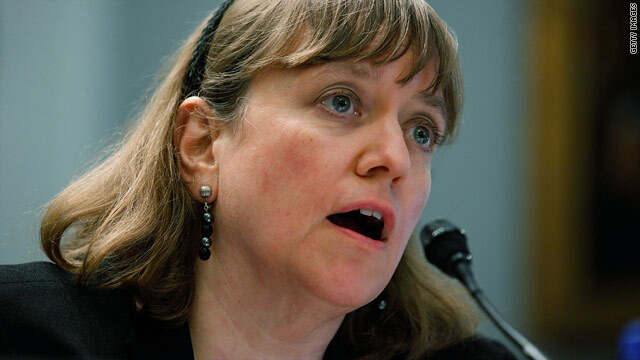 Washington (CNN) -- Minerals Management Service Director Elizabeth Birnbaum resigned Thursday as head of the Interior Department's scandal-plagued Minerals Management Service, the department's chief said. Two sources told CNN that Birnbaum had been fired. The Minerals Management Service (MMS) is involved in federal oversight of offshore oil drilling. Birnbaum's resignation letter cast her decision to leave as a consequence of a decision to reorganize the agency following April's explosion of the Deepwater Horizon oil rig in the Gulf of Mexico. The explosion resulted in a massive oil spill that well owner BP and federal authorities are still trying to cap. "As you move forward with the reorganization of Minerals Management Service, you will be requiring ... new leaders," Birnbaum wrote in a letter to Interior Secretary Ken Salazar. President Barack Obama said Thursday that he didn't know whether Birnbaum had been fired or chose to resign on her own. Speaking before a House subcommittee, Salazar insisted Birnbaum had resigned "on her own terms and own volition." She "is a strong and very effective person who ... helped us break through the very difficult things which we have a lot more work to do," Salazar said. "She helped us with addressing a very broken system. And all I can really [say] is that she is a good public servant." Birnbaum, a former high level staffer on Capitol Hill, became head of the MMS in July 2009. A recently released federal report highlighted what many observers have characterized as widespread corruption at the agency. Among other things, the report, issued by the Interior Department's inspector general, revealed that federal inspectors overseeing oil drilling in the Gulf of Mexico accepted meals and tickets to sporting events from companies they monitored. In one case, an inspector in the MMS office in Lake Charles, Louisiana, conducted inspections of four offshore platforms while negotiating a job with the company, the report stated. The Lake Charles investigation was launched shortly after another scandal emerged from within the MMS. A September 2008 inspector general's report found regulators in the agency's Colorado office received improper gifts from energy industry representatives and engaged in illegal drug use and inappropriate sexual relations with them. Salazar recently called the allegations of MMS corruption "evidence of the cozy relationship between some elements of [the agency] and the oil and gas industry." He pledged to follow through with the Interior Department inspector general's recommendations, "including taking any and all appropriate personnel actions including termination, discipline and referrals of any wrongdoing for criminal prosecution." MMS collected nearly $10 billion in royalties from the energy and mining industries in 2009. Salazar recently announced that he was splitting up the agency to separate its energy development, enforcement and revenue collection divisions, saying they have "conflicting missions" that needed to be separated. The associate director for the agency's Offshore Minerals Management Program also is leaving at the end of May, a month earlier than planned, in the wake of the Gulf spill. That official, Chris Oynes, launched the investigation that resulted in former New Orleans, Louisiana, supervisor Donald Howard's firing in 2007. Howard later pleaded guilty after being accused of failing to report gifts valued at more than $6,600 from an offshore drilling contractor. As part of the growing push to crack down on the MMS, Sen. Bill Nelson, D-Florida, introduced legislation Wednesday requiring federal oil industry regulators to wait at least two years after leaving government service before going to work for companies they helped regulate. The bill also would bar regulators from accepting gifts from oil companies, would require regulators to divest themselves of any stock they may currently hold in oil companies, and would prohibit regulators from part-time employment in the industry.